Published on June 2, 2010 in Elections, General T&T, PNM and Politics. 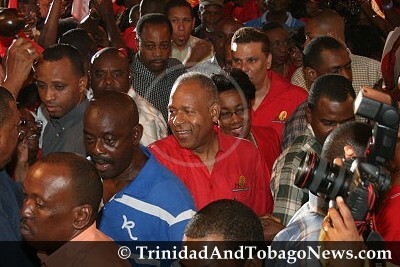 Closed Tags: Patrick Manning, Politics, T&T Govt, Tony Fraser. Can the hierarchy of the People’s National Movement, comprising the General Council, the Screening Committee, and the cabinet be considered completely free of the responsibility of allowing Manning to pursue his imperial designs? As indicated last week, Manning’s decline and his eventual falling on his sword were entirely of his own making, so drunk had he become with his success at dominating all around him, including the national community and polity. However, the legions of mice of men and women (to adjust Steinbeck) who surrounded Manning in the party, cabinet and government—those holding on because it was the best thing that ever happened to them, those who were prepared to tolerate anything once they were close enough to glow in the reflected glory of the emperor—fed Manning’s great ego and gave him a leg-up to the platform he eventually ascended. But Manning did not fall out of the sky, a freak of nature; he is very much a creature of the party and political culture created by Dr Eric Williams. Williams determined that the PNM would not follow the liberal democracy model of the USA, open for contest within; but rather it would be a party more like the British parties in the Westminster system of tight controls on expression of disaffection and contention with leader and organs of the party.